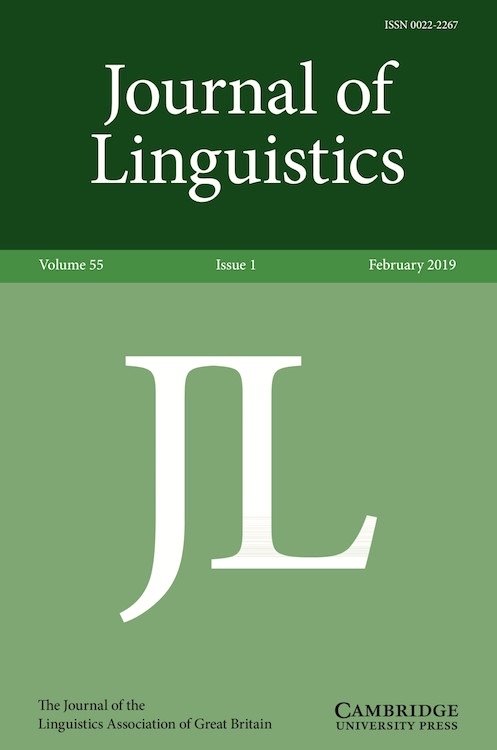 The title of a remarkable paper in Journal of Linguistics 55.1 (Feb. 2019) — published on-line on 1/3/19 — by an international panel of 11 authors, realizing a plan of the senior author, my Stanford colleague Ivan Sag, who died in 2013 before the project could be completed. The English auxiliary system exhibits many lexical exceptions and subregularities, and considerable dialectal variation, all of which are frequently omitted from generative analyses and discussions. This paper presents a detailed, movement-free account of the English Auxiliary System within Sign-Based Construction Grammar (Sag 2010, Michaelis 2011, Boas & Sag 2012) that utilizes techniques of lexicalist and construction-based analysis. The resulting conception of linguistic knowledge involves constraints that license hierarchical structures directly (as in context-free grammar), rather than by appeal to mappings over such structures. This allows English auxiliaries to be modeled as a class of verbs whose behavior is governed by general and class-specific constraints. Central to this account is a novel use of the feature aux, which is set both constructionally and lexically, allowing for a complex interplay between various grammatical constraints that captures a wide range of exceptional patterns, most notably the vexing distribution of unstressed do , and the fact that Ellipsis can interact with other aspects of the analysis to produce the feeding and blocking relations that are needed to generate the complex facts of EAS. The present approach, superior both descriptively and theoretically to existing transformational approaches, also serves to undermine views of the biology of language and acquisition such as Berwick et al. (2011), which are centered on mappings that manipulate hierarchical phrase structures in a structure-dependent fashion. I note two significant characteristics of this work. First, Ivan’s project was not a broad-brush programmatic exercise but a scrupulous attempt to give an explicit description of all the details of the English auxiliary system that he was aware of. Second, this description was to be couched in a framework of static constraints on hierarchical structures, without any of the characteristic apparatus of transformational frameworks. The primary author of this paper, Ivan Sag, worked on aspects of the auxiliary system of English throughout his career in linguistics. He left a version of this comprehensive overview unfinished when he died in September 2013. [At the time, I wrote a conventional death notice for Language Log and a more personal recollection for this blog.] His wish was that it should be finished and published as a co-authored journal article. The task of completion proved remarkably complex, and ultimately brought together a large cooperative team of his colleagues and friends — an outcome that would have greatly pleased him. A surprisingly large number of detailed problems had to be resolved by people well acquainted both with classical HPSG and the sign-based construction grammar (SBCG) that Ivan (with others) was developing over the last decade of his life. The order of names on the by-line of this paper reflects the various contributions to the work only imperfectly. The overall framework and content of the paper are entirely due to Sag; the vast majority of the rewriting was done by Chaves, who was in charge of the typescript throughout, and the other authors contributed by email in various ways to resolving the many problems that came up during the revision and refereeing. This entry was posted on January 18, 2019 at 6:44 pm and is filed under Constructions, Linguists, Syntax. You can follow any responses to this entry through the RSS 2.0 feed. You can leave a response, or trackback from your own site.